There’s something for everyone at the Italian Festival. Summer isn’t over yet. Enjoy the food, rides and games at the annual Italian Festival at North Hempstead Beach Park in Port Washington. Celebrating its 39th year, one of the largest and oldest Italian festivals in Nassau County will be held from Thursday, Sept. 6 through Sunday, Sept. 9. 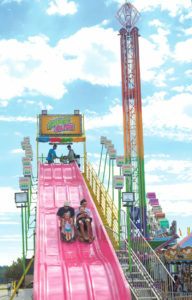 Festival organizers will have a new ride vendor, Blue Sky Amusements, meaning the festival will be filled with new, thrilling rides. Add this to pay-one-price rides wristbands offered every day and the festival will be one of the best yet. The food court offers a wide variety of traditional carnival fare and delicious ethnic cuisine. Be sure to also visit the Sons of Italy John M. Marino Lodge’s Italian pastry and coffee and wine and beer tents. The festival is open Thursday and Friday, Sept. 6 and 7, from 6 to 11 p.m., Saturday, Sept. 8, from 2 to 11 p.m. and Sunday, Sept. 9, from 12:30 to 9 p.m. Ride wristbands are $10 on Thursday, $30 on Friday and Saturday and $25 on Sunday. As part of a beloved tradition, rides will be free on Sunday from 12:30 to 1:30 p.m. There will also be live entertainment every night, a spectacular fireworks display on Saturday night and dozens of vendors with jewelry, crafts and gifts. The festival at North Hempstead Beach Park is the entrance past 175 West Shore Road, Port Washington. Visit marinolodge.org or facebook.com/italianfestivalmarinolodge1389 for details. Like the festival’s Facebook page for details. As with all their other events, the Sons of Italy in America’s John M. Marino Lodge No.1389 in Port Washington donates a percentage of proceeds from the Italian festival to local and regional charities and scholarships. Debbie Greco Cohen is the manager of Greco Integrated Communications, serves on the executive board of the Port Washington Chamber of Commerce and is a contributing writer to Port Washington News.